I've been doing magic for about twenty years, although there were some dormant years in there. I perform mostly for kids & teens, and I love cards, though I've been adding in coin work lately. I'm looking forward to interacting with everyone on this forum! Hello all, my name is Craig and I'm from the great state of Michigan. I've been a casual hobbyist of magic since childhood (with varying degrees of commitment). In the last couple years it has morphed into a much larger beast. I am currently transitioning into being a semi-pro and am always willing to learn. That is the beauty of forums like this. I love all forms of magic, but my favorite style is card magic with a mental flare. On a side note, my wife and I are putting together a two person mental act for youth, and we're pretty excited about that as well. I'm a quiet voice over at the Green place if you recognize the user name. It's great to meet you, David! Thanks for the introduction! I also perform the Whit Haydn's "Mongolian Pop Knot" and his version of silk-to-egg. Two great tricks that always get an amazing reaction. Welcome to the forum, I think that you will find this to be a friendly, respectful and troll-free environment for us to share our love of magic with each other. Doug, welcome to the Magician's Forum and congratulations on finishing your doctorate! I look forward to getting to know you better as be build this community. Thanks for the introduction, Craig! It must be wonderful to have your wife as passionate about magic as you are. I look forward to the insights that you'll share with us here at the Magician's Forum. I appreciate you joining us! Thanks for joining us! Performing for teenagers is fun and challenging. I hope that you'll share some of the wisdom that you've gained in the trenches. Thanks for joining us! Yes, Harry has had to put up with far too much abuse and I created this forum specifically because of that. We hope to create a positive and troll-free community! I'm glad to meet you, Stez! I know of Luke Jermay but I'm not well acquainted with his magic. I've never heard of Pete Firman. Please share some of your thoughts on these magicians with the rest of us. I'm sure that you'll add value to this community and look forward to getting to know you better. My name is Michel Beaudet and I'm from The Province of Québec. I'm praticing card magic since 5 years. I learned a lot browsing the Magic Café and having the chance to read advices from a giant, a genius like Harry. Having a legend like him taking time to answer questions, giving good insights and good stories about other legends is an awesome privilege for me. I'm a nuclear engineer and if I knew that Einstein was a member and a contributor of a physics forum I will pay to be part of this forum and have the privilege to read his posts and share his contributions. So this is why I decided to join this forum. Thank you for introducing yourself and for joining us! I completely agree with you that it's a privilege to have someone of Harry's caliber here at the Magician's Forum to share his wealth of knowledge with the rest of us. I'm glad that you're here, Mike! Welcome! Her passion is a recent endeavor, but I was geeked to find out she wanted Osterlind DVDs for Christmas. I married a winner. Sure sounds like you married a good woman! Hello. I've been a magician since I was a kid in the 60's, and grew up in Central Wisconsin. During the 70's, we had a very active magic community, (IBM Ring #215), which I was very involved with. At the time I did birthday parties, and lots of restaurant and bar magic. I'm in Colorado now, and retired. I'm just once more beginning to perform a bit of restaurant work, and my love of practicing keeps me busy several hours a day. Cards are my passion, and I'm looking forward to talking with others who share my passion. Anyway, I'm glad this forum has been established. Thanks! Now to find some good magic ideas to share and talk about! Harry Lorayne's work has been an inspiration for me, and I'm very glad he's involved with this forum. Thanks for "them kind words", foxlute. But - before the year is out?!?! It's only January!! Not to worry, I'll put aside the items you mentioned, so that I'll have 'em when and if you want 'em. Best - H.
I'm Matthew Olsen, I've been involved in magic for over 20 years. I am also an expert contact juggler and I have written and produced The Visual Encyclopedia of Contact Juggling filmed and edited by the great Bob Kholer. I look forward to some serious discussions of magic and hope to find some help as well as helping others. I've got a lot of ideas and love to hear the ideas and experiences of others. Thank you to Harry Lorayne for guiding me to this site. I hope we can all collaborate to make this a great forum. I'm Bill McCloskey, hobbiest and entrepreneur. Been doing card magic since the late 90's when I was scheduled to speak at CES in Las Vegas and I walked into a magic shop in one of the hotels and bought closeup Card Magic by Harry Lorayne. Been having fun with it ever since. I think I was one of the first 100 members of the Magic Cafe but was permanently banned twice. First, happy to see such a nice interface. MUCH better experience. And already I can sense of feeling of a more congenial atmosphere. I hope for great things here and I hope Harry will continue to hold court for many years to come. It is the closest I'll get to sitting at Vernon's table at the Magic Castle, having Harry available and not having to fight the trolls. Plus there are already more card related posts here than there have been in the last month on the Magic Cafe. Hey Stez: I'm confused! I taught my HaLo Cut originally in RIM SHOTS, not in AFTERTHOUGHTS. I taught my Ultra Move originally in AFTERTHOUGHTS. Let's see - it's been about 41 years since AFTERTHOUGHTS, and I just did a mental count - so I may be off by a few - but I've written 23 books since AFTERTHOUGHTS, not counting my books on memory or the twenty years of APOCALYPSE or my 4-volume DVD set - boy, are you missing out!! What are you waiting for?!?! Well, not important where you learned it - I'm glad that my HaLo Cut is your favorite utility sleight. So great to meet you, Matthew! Thanks for joining us! I'm sure that your knowledge and experience will be an incredible asset to this community! I'm glad that you're here, BillMcCloskey! I'm also happy that you like the simple look of the place as well as the friendly atmosphere. Together, we can keep it that way. This place is for you, so if you want to sell your books or anything else let's go. As you know, the members of this forum are big fans of Harry Lorayne, a true magician in all aspects of the word. To be honest, for me you are one of the last giants, if not the last, who has built, shared and teached the art of contemporary card magic. You are standing at the same pantheon as Vernon, Marlo, Emsley and the others. You deserve all my admiration for your works in memory and card magic. Please stay with us for the next decade. Born at an early age, Greg McMahan loved performing as long as he can remember. Beginning with shows for his parents, including brother and sisters as cast members, his whole family soon took to the stage at local theaters in Cincinnati, Ohio. During the early 1970's, Greg developed an interest in magic, juggling, puppetry and clowning that has continued to this day. He's written instructional books for other children's entertainers worldwide, and has conducted seminars and lectures for various magician & clown organizations. In 2003 Greg traveled with the Clyde Beatty~Cole Bros Circus as their national spokesperson. Using the stage name "Wizard of Odd", Greg promoted the circus on local TV stations, radio & newspaper interviews and live appearances during the show's 9 month, 110 city tour. Now performing professionally in the Atlanta area as "Mister Greggy", Greg has entertained at countless events ranging from birthday parties to the Governor's Mansion. His specialty is children's shows, and he loves seeing the smiles on his audiences faces! Thanks Harry. January is my highest billing month as a great many of my clients wake up and start scrambling to beat the UK tax filing deadline which is 31st January. Consequently I may well feel flush enough to treat myself to some late Christmas presents in February! In the late-70's and early 80's, Tommy Ellison was a well-known name in Birmingham clubs and restaurants around Birmingham. Specializing in close-up magic, Tommy was a big attraction on Morris Avenue and other entertainment districts around town. You may remember the Casablanca Magic Bar adjacent to Bogart's Restaurant - home of "The Wit's Other End", a comedy troupe with deep roots in the Birmingham's theater community. The Casablanca was a favorite stop-over for patrons awaiting dinner or seeking more comedy and magic after the "Wit's" evening shows. But just like Broadway revivals and great movie sequels, Tommy is back... and that is good news for you and your event planners. Master magician Tommy Ellison, performs what is called Close-up magic. This style of sleight of hand magic has been described as the ultimate experience in magical entertainment. It's magic that is performed within inches of the audience and usually witnessed from all angles. Close-up sleight of hand is by far the most challenging magic to perform. The up close, intimate nature of this art form makes it the strongest form of magical entertainment. The close-up magician’s props range from the common to the classic, from napkins, saltshakers and cups to playing cards, coins and even the spectator's smart-phone! Trade shows are a perfect venue for the unique benefits of close-up magic. The magic and presentation can be customized and tailored to fit the product, service or message. And, the natural crowd drawing ability of close-up magic makes it a powerful tool for a successful, lead generating show. For larger crowds a stand-up or parlor style of magic works perfectly. Tommy retains the strong impact of his sleight of hand magic with slightly larger props, like rope, the daily newspaper, jumbo-sized playing cards, etc. Make your next event one your audience will never forget! Sorry for the Third person but I wanted to get this up and move on to reading more important magic post than my bio! Thanks for the great introduction, Tommy! I'm so glad to have you hear and look forward to learning from you. hi guys, here another one! I'm just an amateur from spain, I learn more than I perform because I read a lot (in general). I may not contribute much, but will most like offer an opinion from time to time. I'm glad you're here, Eusbanger! There are some incredible magicians coming out of Spain! Thanks for joining us, James! I'm glad that you're here. I'm an incredibly amateur magician and documentary filmmaker. (I made the short film about Ray Goulet that was shown at the SAM convention last July.) While my only performances are for the family, I enjoy reading and learning about this fascinating world. I'm looking forward to spending some time here. I'm so glad that you've joined us! I'm looking forward to getting to know you. Hello all. My name is Brett. I am using my user name from the other forum to make it easy to recognize (just in case)! I am a serious hobbyist from Columbus, Ohio whose first love is card magic. I also started doing standup and kids magic when my kids started preschool. Happy to be here :-) Much thanks to Harry for the kind invitation. Thanks for introducing yourself, Brett! I'm glad that you accepted Harry's invitation. Welcome to the Magician's Forum. Harry, you did teach the ultra move (and associated/subsequent tricks/sleights) primarily in afterthoughts you teach the HaLo cut cop with a quick description of the HaLo cut for reference. I will endeavour to read more of your books. I saw you were doing a new book signing at Cape Hope (or that was the closest airport) and I seriously considered flying over from the UK to see you. Unfortunately it was a little too pricey. My name is Alex. I am a hobbyist from New Orleans, Louisiana who has been living in Stockholm, Sweden for almost two years (moved for a beautiful Swedish woman). I first got into magic around the age of 12 when I happened upon a magic shop that used to be in the New Orleans french quarter and was burned hard by the classic scotch and soda and the invisible deck (which i later purchased with lawn mowing money). I spend the next year or two collecting more items and eventually did a couple shows to small groups at my junior high school and a couple kids b-day parties. I had a severe stutter at the time, but the rush of performing magic and fooling others somehow forced me to keep performing and speak more. The hobby lasted until the middle of highschool and eventually faded away, that is until I moved to Stockholm. A year into my move I found myself jobless and with mild depression, but I was convinced, by a friend, to watch a specific episode of penn and teller (specifically they kostya kimlat-spelling episode) and that reinvigorated my love for the artform of sleight of hand. I have filled a lot of my free time with job hunting and watching programming videos, during which i practice card sleights. It feels nice to be doing something that I am passionate about once again. I now have the problem many of you have, where it is much more difficult to fool my S.O.... but I enjoy learning new material and enjoy the challenge. I am glad to be here and while I am fairly new, I hope to offer my advice and opinion when I can. också, jag undrar om det finns andra här som pratar svenska eller bor i sverige? Hello all! My name is Alex. I am a hobbyist from New Orleans, Louisiana who has been living in Stockholm, Sweden for almost two years (moved for a beautiful Swedish woman). I first got into magic around the age of 12 when I happened upon a magic shop that used to be in the New Orleans french quarter and was burned hard by the classic scotch and soda and the invisible deck (which i later purchased with lawn mowing money). I spend the next year or two collecting more items and eventually did a couple shows to small groups at my junior high school and a couple kids b-day parties. I had a severe stutter at the time, but the rush of performing magic and fooling others somehow forced me to keep performing and speak more. The hobby lasted until the middle of highschool and eventually faded away, that is until I moved to Stockholm. A year into my move I found myself jobless and with mild depression, but I was convinced, by a friend, to watch a specific episode of penn and teller (specifically they kostya kimlat-spelling episode) and that reinvigorated my love for the artform of sleight of hand. I have filled a lot of my free time with job hunting and watching programming videos, during which i practice card sleights. It feels nice to be doing something that I am passionate about once again. I now have the problem many of you have, where it is much more difficult to fool my S.O.... but I enjoy learning new material and enjoy the challenge. I am glad to be here and while I am fairly new, I hope to offer my advice and opinion when I can. /alex strand också, jag undrar om det finns andra här som pratar svenska eller bor i sverige? I am so glad to meet you and happy that you've found us! 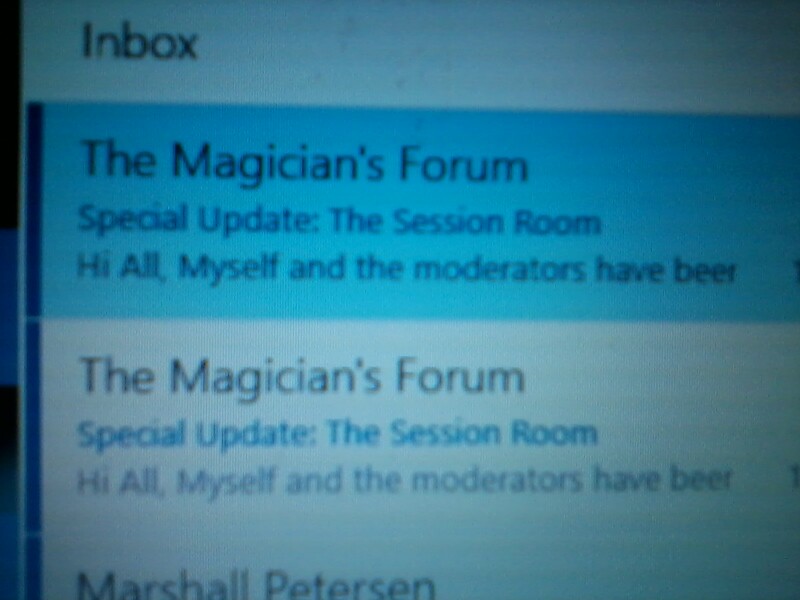 I look forward to many conversations with you here at the Magician's Forum. If you're looking for something to fool your girlfriend...check out our Hidden Treasures section. I believe that you'll find what you're looking for there. from that point on I become a series book collector and only study magic from paper. Welcome to the forums, Morris! You own all of Harry Lorayne's books? Well you will have many friends here. It's wonderful to meet you, Morris! It sounds like you're a true lover of magic. I also believe that you'll add a lot of insight and value to the conversations that take place here. Myself and the moderators have been trying to figure out a way for all of us to talk about some of the finer points about sleight of hand and methodology without fear of exposing secrets to the merely curious. We finally decided to create a password protected section that can only be entered when you've made 100 meaningful and insightful posts. At that point, you become part of the "Inner Circle" and will be given the password. And here's the great thing...Harry Lorayne has agreed to submit one trick a month from two of his books that are out of print: Close Up Card Magic and the Classic Collection Volume 1 and will personally post those in the Session Room!! Wow!! I hope you all have found the Magician's Forum to be a positive place for us to share our love of magic with one another. Thanks for being a part of this growing community! Hallo.... My name is Inigo Montoya. You keel my father. Prepare to.... no wait... that's a movie line. I'm Steve, and I first got the magic bug when I walked into Barry's Magic shop in Wheaton, Maryland (just outside DC) back around 1975. I'm an amateur/hobbyist with basic to intermediate skills and focus on close-up work that I perform for family, friends. I found this site from a post in the "Jaw Droppers" thread over at the green place. Any chance to get credit for my 1479 posts there to translate to 100 "meaningful" ones here? I've seen many of your insightful posts at the Cafe. I trust that your presence here will be helpful and appreciated. Thanks for introducing yourself to the rest of us. Welcome to the Magician's Forum! Hi, My name is Dan and I've been a part of the craft for over 40 years. I started out as a semi pro doing bar and restaurant walk around, but now a days I am more of a hobbyist (though my wife would love to see me out working again). It's great to be here, and I want to thank Harry Lorayne for alerting me to this fantastic forum. I'm so glad that you've decided to join us, Dan! Welcome to the Magician's Forum! Hey y'all my name is Jerome. I'm a semi-pro magician from North Alabama. Been doing magic since 1992. Hope this forum goes well and doesn't turn into the machine the other one did. Hi Jerome, I'm glad that you've found us! Together, we can keep this place a positive, troll-free, grammar-police-free, environment. Got a little worried when I seen this in my e-mail thought like where's mine. Sorry about the double email. I'm still learning how to navigate all the many buttons that make this forum work. Welcome to the Magician's Forum! No such thing as too many emails announcing beer! I didn't realize that there was a beer called Session Room. I'll have to go get me a pint!